An entry in the recently published book, “ Early Irish Golf” tells us that golf was being played in Oughterard in 1906. It is believed that the course was situated at nearby Killaguile (adjacent to where the Ross Lake Hotel is now sited), and that golf continued to be played there up until 1940. The story of our present course dates to 1967, when for £10,000, Miss Allica Willis sold her 140acre estate, to a consortium of local business people – Martin Faherty, Paddy Higgins, Sheila Egan, Annie Egan and Lilly Willis herself, for development as a golf course. Bobby Deacy and Frank Kyne joined the initial investors when they invested in the company in 1969. The Compnay was incorporated on 3rd July 1969 ( No. 29243). The development of the Club took place during 1969, 1970, 1971 and 1972 with many interruptions. When the course development was nearing completition Tom Barry was invited to assist with the setting up of the Club structure. He invited Pat Goggin who worked at Galway Golf Club to join him. Tom Barry invested in the Club at this stage. The course is situated in un-spoilt countryside, in view of some of Connemara’s famous rugged mountains, and adjacent to the rippling waters of Ireland’s second largest lake – Lough Corrib. It is always a haven for members and visitors alike. The site of Aughnanure Castle (depicted on the club crest) watches silently over the course. It is reminder of by gone struggles. One wonders what the castle occupants would think of to-days activities with so many “toiling” over their once rich pastures. The Oughterard Members are now Kings of the Castle, in control of their own realm, and now one feels that their reign will be long and fruitful. Just like the struggles encountered by the occupants of Aughnanure the club had a rocky start. Eddie Hackett, a golf architect was appointed to design the course. Unfortunately Eddie withdrew his services when a picket was placed on his home by members of the Land League organisation who were objecting to the estate been given to a private company for the development of a golf course. Small farmers in the area had expected the land to be divided among them. Several protest meetings and rallies took place in the town objecting to the establishment of a golf course. Items featured on radio, T.V. and in the media as another controversy was brewing locally (See Rosita Sweeteman’s book “ On her Knees”. Incidents such as burning of a hay barn on the Willis Estate and a threat to bomb a director’s place of business climaxed in the destruction of one bulldozer and the damaging of another outside Galway City. The bulldozers were the property of the Tuam firm of Griffiths. Local participation in these events were hotly denied by both sides in Oughterard. The pro golf course elements had no hesitation in blaming Sinn Féin outsiders, while those agitating against the development, though not using the word “blame’ wished it had never happened. Protest demonstrations took place in the Square. The turn out was disappointing as about 40 placards – carrying persons took part, more then half of them strangers to the town. The local participants numbed less then 20. At this stage the people in general wished that outsiders – The Press, TV and Sinn Féin would not interfere in the Golf course dispute. They felt the matter was a problem for Oughterard and only Oughterard people could solve it. Fortunately objections to the course development gradually petered out when people saw the possibility that such a project could increase the number of visitors to the area. for leisure it is unsurpassed. He definitely stood out in the crowd. Even past doubters are happy and some are learning to play. They are pitching, putting and driving and crowds are walking around. It seems everyone is playing a round. The club has been a major employer and presently the club employs 23 including (part-time and seasonal workers) and several benefiting downstream. The responsibility of their welfare rests with the Management Committee under the guidance of the President, Captain and Lady Captain of the club. The first investors invested ₤ 1500 each. Bobby Deacy RIP who was Martin Faherty’s accountant and Frank Kyne were asked to join the company. They both invested ₤500 each. When Eddie Hackett with drew his services Bobby Deacy and Frank Kyne went to London in 1970, taking with them maps of the course prepared by Eddie Hackett, and met with the eminent Golf architect Commander John Harris. He was employed to lay out the course, on land, once owned by the O fflahertie clan, whose ancestral home, at Aughnanure Castle, is only a few hundred yards away. Bobby and Frank met John Harris in his home and they explained their situation and also made him aware of the opposition to their plans for a golf course locally. This did not deter him. He drew up sketch plans which he posted to the company and later he came and surveyed the land. He did a final plan for an 18 Hole Golf Course. He was only paid half the fee as the company agreed to build only nine holes. The fee didn’t include supervision – the company was left to do this work themselves. The next problem the company faced was to get builders to build the course. Frank Kyne and Martin Faherty approached Jimmy Griffiths to build 9 greens, 9 tee-boxes, remove walls at a cost of ₤9,000. This was agreed to. It was also decided to drain the existing ground of the 9th, 10th and 11th holes – drainage to cost extra. He had just spent a week working on the drainage when a machine belonging to him was blown up on another site he was working on in the Ballybane area in Galway. This was suspected locally to be the work of the IRA who were now involved in what became known as the “Brid Fahy Eviction”. Locals suspected that the Land League and IRA were now working hand in hand. It must be said that no one was brought to trial or even accused about this incident. Jimmy Griffiths took the threat seriously and he withdrew his machinery. He was never paid for drainage-work as he didn’t complete his contract. The benefit of a Golf Course to the community. The employment it would give to locals during the construction of the course. On completion of the course, the permanent employment that would ensue. The substantial increase in market value of lands in the surrounding district. The importance of a golf course as a tourist amenity, because it would lengthen the tourist season in Oughterard. Four representatives from each side attended the meeting. Gortreevagh Golf course Company were prepared to hold all the land on the Portacarron side and were prepared to relinquish the land on the Galway side provided that all opposition both locally and nationally would cease. The Land League representatives would not agree to this proposal – the “wanted the whole lot or nothing”. The spouses of the private shareholders were entitled to attend company meetings. Mary Faherty or Mary Kyne did not exercise that right. Maura Higgins attended on a regular basis and helped Annie Egan to write the minutes. Maura was a lawyer and offered advice from time to time about the legal position of the company in the face of the ongoing opposition. Jim Egan became involved when he arranged local workers to work on the project at double the County Council rate of payment at the time – ₤30 per week. The first record of payments to course staff was for the week ending 26th June 1971. Mattie Healy (foreman), John and Mattie O Connor were the first workers to enter the land with a slash hook and a spade. Jim Walsh, Tom O Shaughnessy, Marty O Toole, John Healy, Tony Connelly, Conie Delapp, Stev O Connor and John O Toole, Frank Mc Donnell, joined them some days later. They now had spades, shovels and wheelbarrows!! Paddy Molloy Camp St. with his tractor was hired for ₤45 on July 17th. They started to remove the old stone walls and to build the old first six tee boxes (now the 1st 10th 11th 12th 13th 14th). The first green was originally placed out in the middle of where the 9th fairway is to day. It was considered too expensive to locate the green here as the land was very wet and boggy. The green was pulled back and the men’s tee box was pulled back. There was a steady work force during ’71, ’72 but work ceased during inclement winter conditions. Jim Walsh was retained during such stoppages with some assistance from John O’Connor from time to time.. It was now evident that machinery had to be purchased or hired. In August 1972 Mick Joyce was willing to bring in his machinery (JCB) at a cost of ₤80 per week but he was warned off. There seems to have been a lot of intimidation going on as people wouldn’t hire or sell the company machinery. Frank was warned and intimidated but this made him even more determined in his efforts to build a Golf Course that he believed would eventually benefit the locality. Annie Egan, Maura Higgins, Sheila Egan and Lilly Willis were strong ladies – they weren’t going to be intimated in any way. No one was going to scare them. I found this period difficult as my children were very young and it wasn’t popular to be involved with the golf project. We couldn’t get an engineer to read the plans. We borrowed a special ruler form Frank’s brother Paddy Joe, an engineer and we spent night after night trying to make out the levels. Marty Toole was a great help. Tow friends of Frank’s came to the rescue. They bought a mechanical loader, tractor and trailer for ₤1500 and brought them on to the site in the middle of the night as they couldn’t do it in daylight. They made a gap in the wall and drove them in at the 13th tee box. The next problem they encountered was to get someone to drive the machines. Jim Walsh drove the tractor and John Joyce R.I.P. Bunagippaun drove the loader. The local Land League were not too pleased with this development. Martin Faherty received a bullet in the post and blank bullets were thrown in on Mattie Healy’s property in Tullaghcath. It was then that Garda protection was put on the machinery in the Golf Course. !973 Workers on the course were Jim Walsh, John O’Connor, Marty Toole, Mattie Healy and Paddy Molloy. Casual labourers – one being Martin Clancy were employed with Jim Walsh during 1977, ’78, ‘79. ’80. Present at the meeting were Paddy Higgins, Martin Faherty, Frank Kyne, Tom St. John Barry and Pat Goggin. Tom St. John Barry was elected Captain, Paddy Higgins, President and Pat Goggin as Secretary. The next meeting wasn’t held until 14th May 1974. In 1973 Mr. Gus Murphy was appointed Club Professional at the rate of ₤32 per week. He did not remain long with the fledging young club as there were few members at the time. The course was opened in 1974. Members were invited to join with entrances fees at £10 and subscriptions at £30 for families, £25 for ordinary members and £15 for associates. During 1974, 70 males and 40 females joined the club. The first Captain was a prominent Galway businessman, Tom St. John Barry, R.I.P. and the first Captain’s prize was won by John Collins (now in Galway Golf Club), with a score of 28 Stableford points, for eighteen holes. Among the prizewinners that day was Frank Kyne who later became Captain and President of the club and was in 1990 awarded Honorary Life Membership for his vision, dedication, commitment and long years service since the foundation of the club. The owners, now Gortreevagh Golf Course Ltd., continued to manage the affairs of the club up until 1982, when the members desiring to see the course and clubhouse develop to its full potential inspired them to undertake a bank loan in excess of a quarter of a million pounds to buy the controlling shares in Gortreevagh Golf Course Ltd.
Up until 1982 little development work was undertaken by the company. The course and greens were under developed, machinery was inadequate and often malfunctioning. The stone buildings enclosing the courtyard, which were previously in use as farm buildings, were falling into disrepair. Toilets were primitive shower and locker facilities were nonexistent. The bar consisted of a counter in a white washed cow byre. Becoming a members club was a major step forward for the club. Mr John Geaney, Jim Byrne, Frank Kyne, Pat Quigley, Joe Joe Faherty and Bartley Lydon were the negotiators between the Company and the Club. Trustees; Paddy Walsh, Portacarron, Tom Morley, Frank O Malley, Joe Browne and Pascal Mc Donagh. 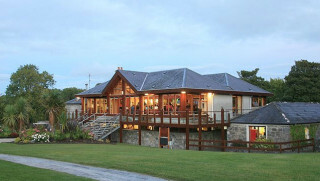 The period 1982-1986 saw the course and clubhouse facilities under the ownership and control of the members, undergo a dramatic transformation. A massive redevelopment programme was undertaken, which saw the farm buildings being converted into modern clubhouse facilities – bar, kitchen, lounge, billard room and office. This reconstruction work was achieved with the minimum of outside professional or technical assistance, the members themselves contributing freely and unselfishly of their time, talent energy and indeed money. On the course, too, the members were over seeing, and often executing course and greens maintenance, which resulted in the nine holes being nurtured to an excellent condition. Additional machinery was essential, so too was a programme of tree planting, but chiefly it was the input of the members that brought about the vast improvements. The greatest achievement was the construction of the new nine holes, bringing the course to an eighteen hole, 6040 yards, par 70. The work here included the clearing of woodland and reclaiming of bog to make fairways, the building of attractive stone faced tee boxes, and of course the construction of nine new greens with excellent putting surfaces. This period also saw the installation of an automatic irrigation system and the construction of a new machinery shed and workshop. All of the development and reconstruction work was achieved without recourse to additional borrowing. With members support the club successfully sold two 2,000 car draws raising ₤140,000 in the process. The years 1987-1988 were times of financial restraint, with the burden of bank repayments, coupled with high wage costs, making capital investment unwise. Despite this, essential improvements such a s leveling and layout of the car park, and the preparation of the practice range were undertaken. This period, also, saw the club engage a professional consultant to advise on greens maintenance. New member continued to be attracted but not in sufficient numbers to make the club financially independent. However, our course had achieved a reputable status for Society outings, and casual green fee golfers. Our location adjacent to Lough Corrib on a major tourist route, had resulted in a healthy influx of visitors. Our green fee income was in excess of ₤32,000 achieved largely at a modest ₤5 daily. Efforts at this time were made to develop this source of income to its full potential, and indeed the ability and willingness of Oughterard Golf Club to offer the visiting golfer top class facilities received official Government approval by the club being awarded ₤10,000 development grant in 1988. An EGM was called on the 11th November 1994 with the purpose of adopting a New Constitution and introducing Equal Rights to all Club members. While the motion was defeated at this meeting the members requested that a further General Meeting be held after another draft of the constitution was submitted by the sub committee under the Chairmanship of Frank O Malley, Jim Byrne, Pat Quigley, Carmel Burke and Mary Kyne. Motion for discussion: “ That the draft New Constitution and Bye Laws of Oughterard Golf Club shall be adopted as the New Constitution and Bye Laws in substitution for the existing Constitution and Bye Laws’. Proposed by the Captain John Lee and seconded by the President Paddy Walsh. 62 voted in favour and 14 against the motion. The Committee invited ladies to join as ordinary members or remain as Associates members if they so wished. Life members were required to pay the same differential as other associates members wishing to become ordinary members. March 4th 1995 Vote on the New Constitution. The introduction of the New Club Structure and the election of the 1st Club Committee (Management Committee) was a momentous occasion in the Club and great attention was given to the “layout of the polling room, security and safeguards to be employed to ensure that voting could be carried out privately and free from duress, and above any charge of suspicions.” Michael Ryan assisted by Martina Canavan supervised the polling. Mr. John Geaney ensured that the polls closed properly at 8pm and that the ballot papers remained locked pending the arrival of the 3 Tellers who were proposed at the outset of the meeting. The New Constitution was adopted. Committee: Maura Maloney, John Barrett, Martin Joyce, Michael Lee, Gerry Nash, George Rocca, Johnny Molloy Brian Claffey and Pat O Sullivan. Major developments took place in 1998. The construction of a new Clubhouse costing ₤1.2 million was completed. The work included a new Bar, Lounge, Restaurant, Kitchen, new men’s and ladies locker room and changing rooms. The new building retained the character of the old courtyard area much admired by members and tourists alike. Construction of 18 new sand based greens and tees at a cost of ₤600,000 was also completed later in the year and was ready to be played on in 1999. The new development made Oughterard a very attractive venue for both members and visitors alike. 1990 will long be recalled by members of the club as the year when we won our first National title – “The Pierce Purcell Shield”. The team defeated Kilkenny in the All Ireland final. “The Pierce Purcell “is the most representative of all inter club competitions, involving at that time some 500 golfers from an estimated 5,000 eligible middle ranged handicappers in 277 clubs nationwide. Each club selected a team captain whose task was to arrange trials, from which he could pick potential combinations. Oughterard’s team Captain was Pat Quigley, a shrewd observer of golf and a keen analyst of the game. He used 17 different players in the course of the campaign, making alterations to suit courses, conditions, occasions and of course taking individual form into consideration. Clubs were drawn firstly on a regular basis, and succeed to provincial level with victors emerging to represent the relevant province at National level. Oughterard’s progress to the final involved wins over the local neighbouring clubs before accounting for Ballyhaunis and Mountbellew in the Connacht semi-final and final respectively. The National Finals were played at Westport Golf Club with Oughterard drawn to meet the Munster champions, Limerick and Leinster’s Kilkenny playing Kirkstown, the Ulster representatives. Team Captain Quigley made two changes from the Connacht final team and entrusted the following pairings with the task of reaching the All Ireland Final: Joe Healy and Steve Mannion, Johnny Lee and Martin Faherty, Bartley Lydon and Kevin Clancy, J.J. Faherty and Dave Healy, Michael Lee and Joe Noone. Anxious hours ensued as fluctuating fortunes kept the outcome in doubt right up to the final act when the Oughterard pair of J.J. Faherty and Dave Healy held their nerve to clinch a famous victory. For the following days final the team Captain made two changes and introduced Dave Connelly and Dermott Mc Grath who fully vindicated his wisdom with a resounding 3/2 win. Michael Lee and Joe Noone continued their winning ways with a comprehensive 5/3 victory whilst J.J. Faherty and Dave Healy were again locked in a tie breaking and pulsating contest, the outcome of which would determine the destination of the Title. The huge contingent of Oughterard supporters could barely look on as the ice cool Healy set up the winning strike with an immaculate pitch to the 17th green to thunderous applause form the home crowd. Faherty calmly and surely putted for the match and the Shield. Later that evening the scenes in the Clubhouse were unbelievable as the team made a triumphant return. Club Captain, Raymond Croke in congratulating the team spoke of the wonderful spirit which prevailed earlier in Westport and of the magnificence of the occasion, a sentiment echoed by the club members and by the local community who joined in the celebrations. The success of the Pierce Purcell team in winning the title turned Media and public attention to Oughtetrard and they high lighted the tremendous progress made by the Club in only 16 years existence. Tourist officials now recognized the vast potential of Oughterard Golf club as a major contributor to tourist development in the west of Ireland. The 12,000 visitors who visited the club during that year bore witness to the input of the Club to the local economy. We were regarded at that time as the most progressive club in the West where visitors received a warm friendly welcome, good food and excellent value when compared to the more celebrated Clubs in the County. The Club in conjunction with the Oughterard Angling Club staged a fishing and golf competition, which was an unique idea, to attract both sets of sports people to the area in 1992, ’93, 94, 95’. In 1993 a total of up to 43 teams of 4 participated comprising of 2 golfers and 2 anglers in each team. The anglers were assigned to a Boatman and fished on Lough Corrib for three days, whilst their partners played golf in Oughterard, on two days and Galway Golf Club the third day. Three times World Fly Fishing Champion, Hans Ruidi Hebesen from Switzerland was among the many notable entrants. Participants from Dublin, L:ondon, Cork, Leitrim, Wicklow, Laois, Mayo and Galway joined local anglers and golfers for the event. Well-known sports commentator Micheál Ó Muirtheartaigh opened the competition in 1993. Bartley Lydon Club Captain, Bobby Curran, Chairman of the Angler’s Association and the Mayor of Galway Padraic Mc Cormack T.D. welcomed the competitors. The 43 pairs of anglers were present at Oughterard Pier for Bobby’s Roll call at 10.30am on Friday morning. Angling conditions were difficult but despite this 21 boats returned 50 fish with John Barrett and Ger Lambert taking the top marks of 50 points. Their golfing partners Tom Durkin and Kathleen Boylan added a further 41 points to give them a share of 1st place with Swen Capp and his team of Robert Symes, John Boucher and Helen Hayes. A late night of music and song followed. On Saturday the new leaders were George Rocca, Seamus Conneely, Jimmy Molloy and the 1992 winner Gerry Molloy. Entering the final day only 10 points divided the top eight teams. On Sunday the Golfers had an early “Shotgun” start at 9am and the 4th placed team of T.J and Cathal Jordan set themselves for a high-ranking position with a magnificent score of 50 points. In the afternoon as the golfers set out for famed Inchagoill Island on board the luxury “Lady Ardialaun” and her by now “sozzzled’ passengers, the wit and “craic” cloaked the intense suspense. In the evening as boat after boat weighed in with fish in what was to be the biggest catch of the weekend with 26 boats returning fish. The biggest catch of the day belonged to Gerrry Mc Donnell and Michael Walsh, who added 57points to the Jordans’ 50 to win with a total of 282. In the end just 20 points separated the top ten teams. In the International section Hans Ruidi Hebesen was well fancied but the Insurance Underwriting Services Team from London with John Mc Il duff. Monica Jordan, Jane Crowe and Tony Royliston on 226 points emerged as winners. Tony Royliston had good reason to be pleased with his weekend when with boatman David Healy he landed a whopping 15lb salmon. Presentation of prizes took place after the Gala dinner at Oughterard Golf Club to a very satisfied and jovial gathering all extremely pleased with the weekend and vowing to return with additional teams for the 1994 event which was set for the now established weekend in May. The organizers who were by then planning the following years event were convinced that a limit of 50 teams would be achieved quite early and intending participants at the time were advised to book early. 52 teams entered for the competition whch was held between April 28th and the 30th. All 52 boats left Oughterard Pier each morning while the Golfing half of the teams were trying to amass as many points as possible over the 3 days on Oughterard’s golf Course to compliment the fishing tallies. The highest aggregate score scooped the prestigious O Neill’s Cup as well as heading up a £12,000 prize bonanza. Members of the team were John Bresnihan, Brian Kyne, Robert Jordan, David Nash with subs. Daren and Eoin Waters and Jones Ferris. They won the Jefferson Smurfitt National Foursomes Trophy when they defeated the Ulster champions, Portstewart in the All Ireland final at Mullingar. This represented a major success for these youngster under the captaincy of Pascal Mc Donagh and more importantly it brought the Club its second National Green Pennant. Following their successful campaign through Connacht, the boys played the highly fancied Laytown and Bettystown, representing Leinster in the semi-final and after some tremendous quality play emerged winners by the narrowest of margins, winning by one hole. In the final v Portstewart, Oughterard were clearly the better team and confirmed this by winning by an emphatic eight holes. With basically the same team Oughterard also contested the All Ireland finals of the Fred Daly Trophy, also played at Mullingar the same weekend. The format for this tournament was singles match play off scratch, and the boys with handicaps from 5- 12 put up an excellent performance against the might of City of Derry with a handicap range from 2-5. In fact four matches were level on the 18th tee but at the 18th, unfortunately for Oughterard, City of Derry one of those at eighteen, another at nineteen, Oughterard won another at eighteen whilst the fourth was called in, the official result was three and a half to one and a half – victory for City of Derry who went on to easily win the final. Continuing on with their success in what was an exceptional week John Bresnihan and Eoin Waters qualified for the final stages for the Irish Boys Championship with both featuring in joint fourth place at 12 over for the three rounds of golf. Great credit must go to team captain Pascal Mc Donagh Junior Convenor who had tremendous success in 1995 with two Connacht Pennants and one National Pennant and he was also Captain of the County Galway Boys Team which won the inaugural Connacht Provincial Championship 1995. He was also honoured at Provincial level by being appointed team manager for the Connacht Boys team who were attempting to retain the boys Inter Provincial Championship which were played at Masserene Golf Club Belfast August 1995. This page was added on 04/08/2015.